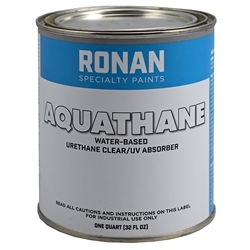 Aquathane UV Absorber is a high quality single component water based aliphatic urethane formulated for use as a protective topcoat clear over Graphic Arts work when resistance to the effects of long-term exposure to sunlight, weather and chemicals is a requirement. it dries to a durable, flexible finish that is abrasion, weather, gasoline chemical and ultraviolet resistant. Non-Flammable, low odor.